For many years, link|that has been investing in the new possibilities that can be tapped with Artificial Intelligence. We support current fields of research, enrich our software portfolio and make the previously impossible possible. LinkThat Prism unites KI-based tools like pattern and speech recognition, document processing and many more. The AI Suite unleashes untapped potential. Learn more. Building on Neural Networks, we provide a fast and reliable solution for number plate recognition in the cloud. Find out how it works and how you might benefit from it. Find out more..
link|that uncovers an new range of possibilities with Neural Networks. 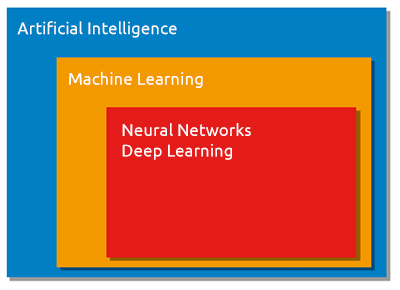 But first, let's start with clarifying the terms Artificial Intelligence, Machine Learning, Neural Networks, and Deep Learning. All technologies used in connection to the goal to create intelligent services, which were previously reserved for humans, are unified under the generic term artificial intelligence - abbreviated AI. If someone does not want to go into too much detail, he/she simply talks about AI today. The goal of the AI is to provide an intelligent agent. This can also be regarded as the production of the best possible (autonomous, learning, intelligent, automatic) information system. Machine Learning is a strategy that uses training algorithms that can learn from collected data and make decisions. Instead of using a single instruction, these algorithms collect data from multiple sources to learn and make predictions. The power of these solutions in the real world is in part limited by the fact that they are based on a set of predefined algorithms more or less reminiscent of a flowchart. On the other hand, another kind of solutions does not have these limitations and therefore makes the realization of previously seemingly impossible strategies possible: Neural Networks. Neural Networks are an important part of Machine Learning. It is the field that will be responsible for fundamental technological upheavals in the years to come. A neural network does not have to be explicitly programmed for its tasks; it can learn from training scenarios, for example, or through reinforcement, so to speak through the 'carrot and stick' method (reinforcement learning). This is based on layered neurons and directed, weighted connections between these neurons. The following figure shows the architecture of an exemplary neural network. The task here is the recognition of numbers. The design of the proposed solution consists of three layers of neurons and their weighted connections. In the training phase, the neural network learns based on the given learning material. The learning rule specifies how the weights of the connections are modified during further learning steps. Even with high-dimensional systems and with tasks with imperfect data, such a trained network will provide robust results. AI and Neural Networks are a corner stone of link|that's portfolio. The ability to develop agents capable of learning complex tasks that exceed human analytical potential opens up a new level of quality for our solutions. See for yourself and try link|that Prism and the demo of link|that CARPARK - intelligent software tools that provide reliable results with Reinforcement Learning. You can reach us via phone +43 (1) 3344044 and email office via linkthat to eu.